Possibility of long down-time with four players. Large amount of tabletop real estate as each player has their own board. Take me down to that nice Dice City where the caves are mines and the buildings are pretty…. I’d like to tell you about Dice City, by Vangelis Bagiartakis who brought us such diverse games as Oath of the Brotherhood and Sing It. 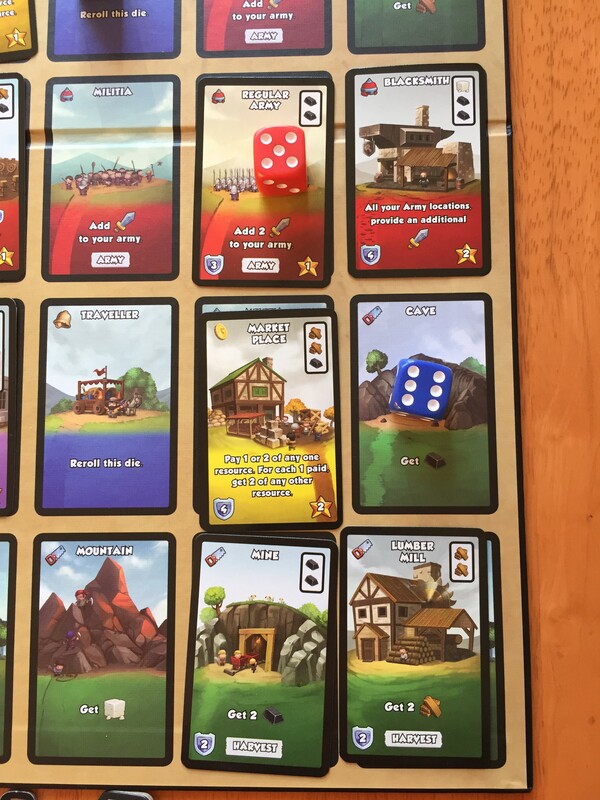 It’s a rather tidy worker placement game with a twist; it’s the dice that do the talking. The aim of the game is to gain supplies to build and defend your city; and ultimately gain more victory points than your opponents. Each player has a City Map board which is a 6 x 5 grid with a variety of locations, and their own set of five differently coloured dice. There are also location / structure, harvest, bandit and export cards; and a pile of steel, stone and lumber. To play the game you roll your five dice and place them in the corresponding area of your board; the yellow dice on the yellow row, the white dice on the white row etc, in the numbered column which corresponds to the number on the die. 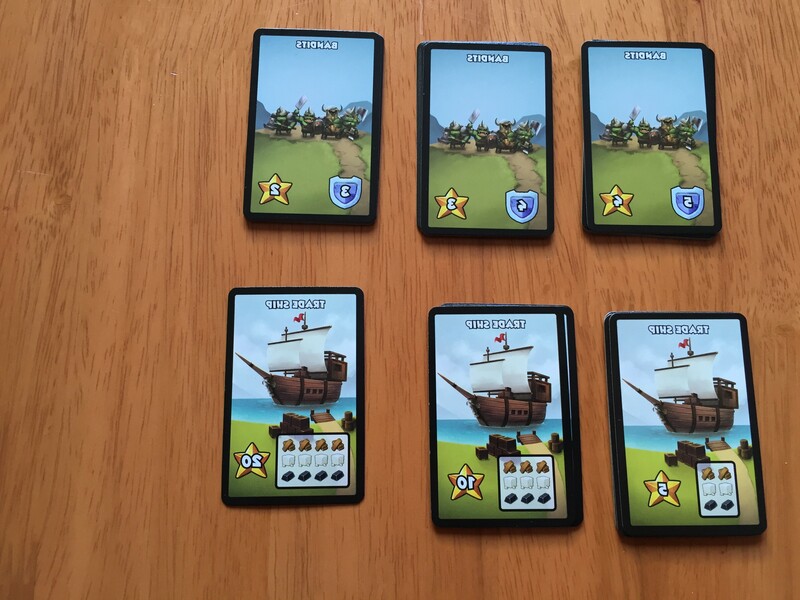 Each space represents an action that can be done, such as using your army, or a resource that you can harvest; lumber, stone or steel which can then be used to build structures in your city, or equip your armies. The location and equipment cards you buy simply cover the original city grid thus creating your new city. Initially each harvest area is worth only one resource, but you can buy a mine for your cave and earn two steel instead of one, a lumber mill to double your forest harvest or a quarry to reap better returns from your mountain. The caveat here is that when you end your turn you can only keep one each of any resource. This ensures that you can’t stockpile which can be important when it comes to earning victory points later on. You can also use your harvest to export goods to earn victory points. The amount of harvest you get in a round can mean the difference between five and twenty points so those mines can be well worth the investment early in the game. Once you start to get multiple resources per turn you can build useful structures such as a Festival Hall which gives you extra victory points, a Merchant Guild which gives you extra resources or a catapult which adds to the strength of your army; which you can use to defeat Bandits and gain victory points. There’s also a back-stabbing element for the more vicious players amongst us, where you can use your army to attack opponents and destroy their buildings; however as there’s not much to gain from that it seems better to simply play against each other for points rather than attack. 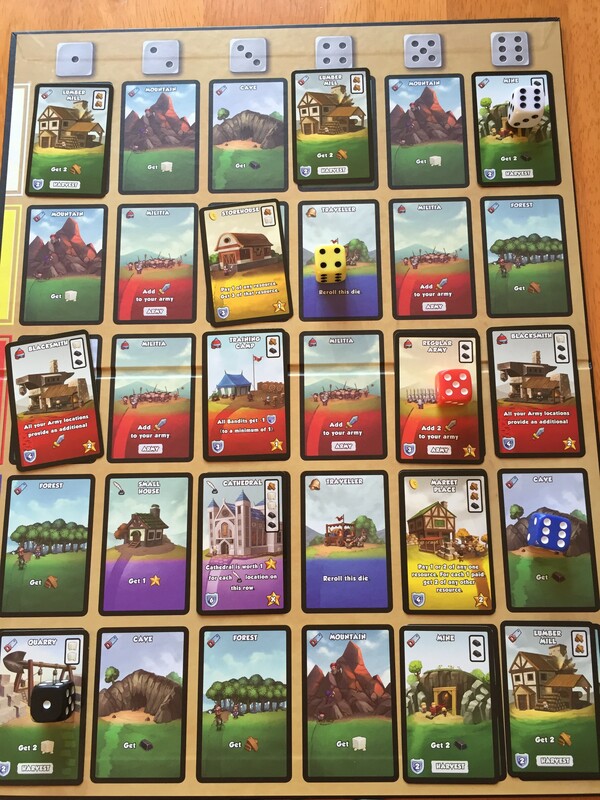 The game ends when all of the location cards are used, or a player completes two rows / columns of their city and chooses to end the game. 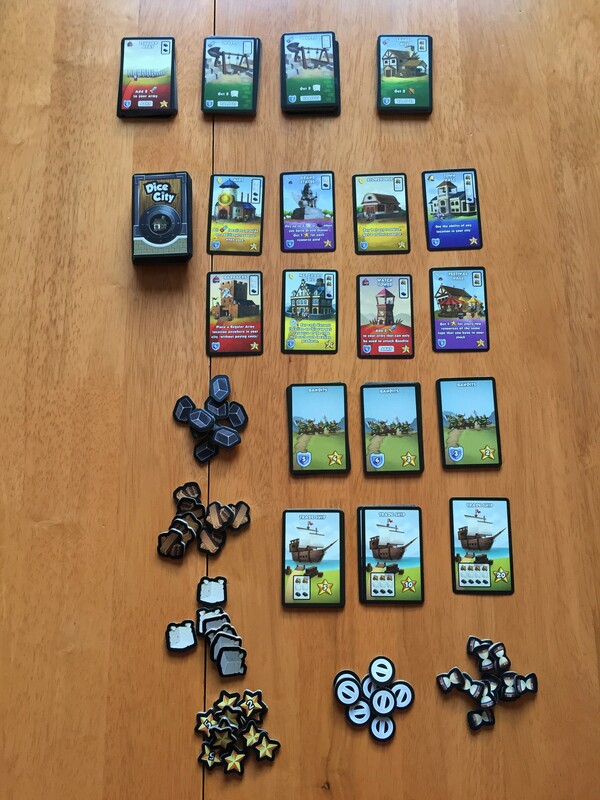 I played Dice City several times over a weekend and really enjoyed it. The dice tend to determine which strategy you use to gain your victory points; my first game I kept landing on Army squares, and ended up beating up a lot of bandits in order to win; when I next played I tried this again but as I kept landing on other squares, I had to change my tactics halfway through and lost miserably to my opponent who went heavily into trade right from the start. 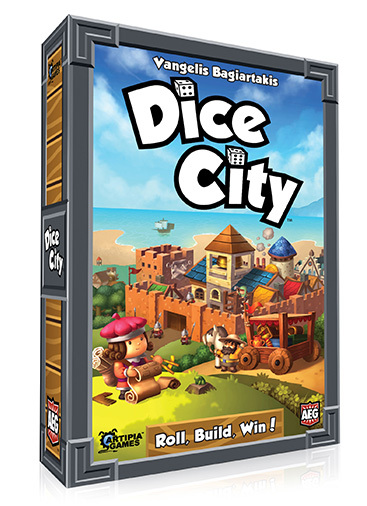 Dice city is very playable, with excellent production values and a number of strategies for winning. It’s a very pretty, colourful game with some nice artwork. It takes around forty-five minutes for a two player game and around an hour for the four player games that I’ve watched. Several games in; I want to play it again and I think it will have good repeat playability with a variety of ages and gamer levels as it’s really easy to learn. My only issues are the sheer amount of table space used if you have four players as each player has their own board, and the possibility of extended down time if a player gets analysis-paralysis. OH WON’T YOU PLEASE TAKE ME HOOOOOMEEE!